An old man collapsed while crossing a street in New York City and was rushed to a hospital. Lying there in a semiconscious state, he kept calling for his son. The nurse on duty went through the old man's pockets and found a well-worn letter from his son. The address on the envelope indicated that the young man was a marine, stationed in the state of North Carolina. She called the camp and the young man was rushed to the airport. He caught the last plane which might enable him to reach his father before he died. It was dark by the time the tired, anxious marine reached the hospital. As he entered the dimly-lighted sick room, the nurse whispered into the patient's ear, "Your son is here." The old man could scarcely open his eyes. But. as he saw the figure of the marine standing outside the oxygen tent, he extended his hand. The young man grasped the frail hand and squeezed a message of love and encouragement. Then he sat down by the bedside for an all-night vigil. The night was long and the young man was exhausted by the trip. Occasionally, the nurse suggested that he rest for a while. He refused, sitting there, holding the old man's hand, offering words of hope. A few minutes before dawn, the patient died. Gazing at the old man's face, he said to the nurse, "Who was he?" "Wasn't he your father?" she asked in surprise. "No," answered the young man, "There must have been some mistake. They apparently contacted the wrong marine." "Then, why did you stay?" the nurse asked. 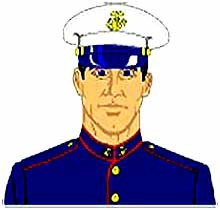 The marine replied, "He obviously couldn't see very well and thought that I was his son. He needed a son at this time.